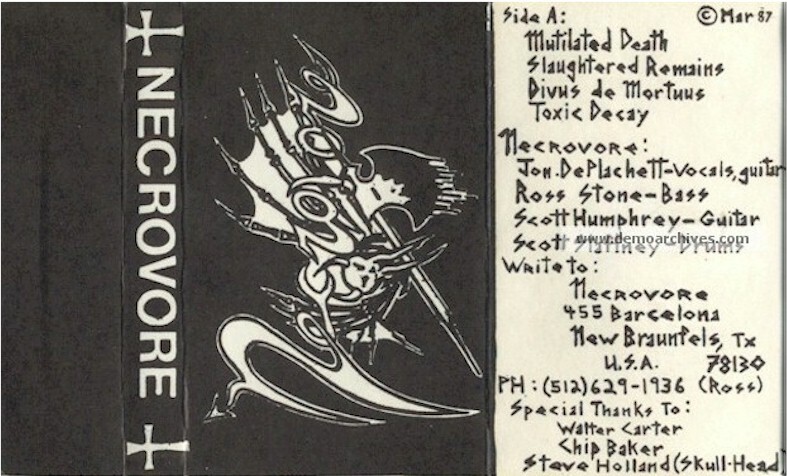 Necrovore was formed in 1986 in Texas, USA, and quickly became one of the most important bands on the American underground metal scene. Frontman Jon DePlachett held scene credits with MATRIX, MESODAEMON and DEATH CORP. They issued one raw tape, recorded in the band's practice room on a four track tape machine in March 1987, which ignited their own underground legend. The band's demo 'Divus De Mortuus', recorded by a line-up comprising DePlachett, guitarist Scott Humphrey, former OBSESSED DEATH bassist Ross Stone and drummer Scott Staffney, is undoubtedly one of the founding bedrocks of the Death Metal genre. During 1988 the track 'Slaughtered Remains', a cleaner studio version, was contributed to the New Renaissance compilation album 'Satan's Revenge Part II'. Line-up changes in the Autumn of 1987 saw Humphrey superseded by ex-OBSESSED DEATH and ANKOU man Bjorn Haga on guitar. With this roster, NECROVORE debuted live in May of 1988 at the San Antonio Cameo Theater. The band commenced work on a second demo session, but this would not be completed. Javier Villegas of HELLPREACHER would man the drums for the latter stages of the band's original career. NECROVORE folded in 1990. Xerox covers. No lyrics. Regular tapes.